These are my notes from setting up a headless Raspberry Pi to act as a Squeezebox Client and a Bluetooth audio endpoint. I got the image to install from http://downloads.raspberrypi.org/raspbian_latest. Instead of downloading a special tool, I just used what was built in to OS X. It worked fine. Airport Extreme (my main wifi access point) doesn't have a good way of finding the DHCP clients. Instead I just starting sshing to addresses at the start of the reservation range until I found my pi at 192.168.0.7. (A better way, arguably, would be to do an nmap scan, or use a wifi router that lets you see the client addresses). To figure out what the mac address was so that I could set a DHCP reservation for that client so that the IP address wouldn't change again. This worked, but I was getting extremely high ping times. Numbers like this aren't really acceptable. Some brief investigation led me to this post, which suggests seeing if 'sudo iwconfig wlan0 power off' would solve the problem. It did. Immediately after running this command my ping times fell. I then added the line 'wireless-power off' to /etc/network/interfaces. This turns off power management for the 802.11 interface. After all this I encountered the problem that if I plugged in ethernet, it would shutdown wifi. This was because of ifplugd. The simple solution is just to uninstall ifplugd (from http://www.raspberrypi.org/phpBB3/viewtopic.php?f=36&t=67761). This has the side-effect of leaving eth0 up even after it isn't connected. This may or may not be a problem. There's likely a better way to do this (some of which I tried with no immediate luck). That's the basic setup. Next time, configuring bluetooth audio. Installing Python-gnupg (http://pythonhosted.org/python-gnupg/) on a Raspberry Pi shouldn't be much different than installing it on any other *nix system. I'm documenting it here just for my own personal notes. The script above works (and doesn't do much), but takes a long time to run. This can be sped up by install rng-tools, however rng-tools requires a hardware random number source. The Raspberry Pi has a hardware component for random number generation, but the software for it was just recently released. (http://scruss.com/blog/2013/06/07/well-that-was-unexpected-the-raspberry-pis-hardware-random-number-generator/). Now performance is much better. In this example, 'bob@inyourbits.com' is the intended recipient (we've previously imported Bob's key) and "hello world" is the data we're going to encrypt. Here we decrypt the data sent to Bob (we must have Bob's private key installed for this to work). Note the use of str() around 'encrypted_data'. That's because .encrypt doesn't return a string, but rather something that can be turned in to a string. In this example I had the private keys for both parties installed on my system. That's not realistic, but it's enough to become familiar with the software before starting to much around across systems. Key distribution is often hard. Regular gpg can be used to do the key management if you don't need to do it in python. It's probably easier that way. The Bluetooth module for my Arduino (the JY-MCU) arrived a few weeks ago. It was really inexpensive ($8.20), but took a long time to ship (3 weeks or so). I picked it up from Deal Extreme (http://dx.com/p/jy-mcu-arduino-bluetooth-wireless-serial-port-module-104299). Be sure you hook it up correctly! One of the disadvantages of this Bluetooth module is that it apparently doesn't have any power protection. So you could easily short it out and release the magic smoke. 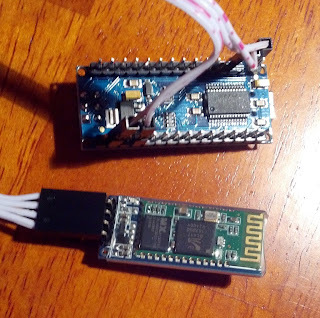 Once it was powered on I was able to scan for it using my Android phone and pair with the Bluetooth module (It shows up as 'linvor' and the pairing code is 1234). 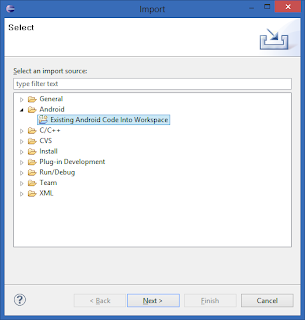 For python for android I installed 'Python3ForAndroid_r6.apk'. Once it's installed you actually have to start the application (called 'Python3 for Android') and click 'Install' to let it install whatever it needs before you can go any further. Now I don't have the sensor they're using, so I'm just using this as a quick example to get an LED blinking. I started SL4A on my Android (to make sure it could create its directories before I uploaded anything). Then I plugged the phone in to my computer and copied the androino files above to /sdcard/sl4a/scripts/. It ain't pretty and definitely needs some work, but it was pretty easy (took maybe 30 minutes total). Now I can blink an LED on the Arduino wirelessly using Bluetooth. That's not much, but triggering other hardware should be pretty similar. That's for next time. 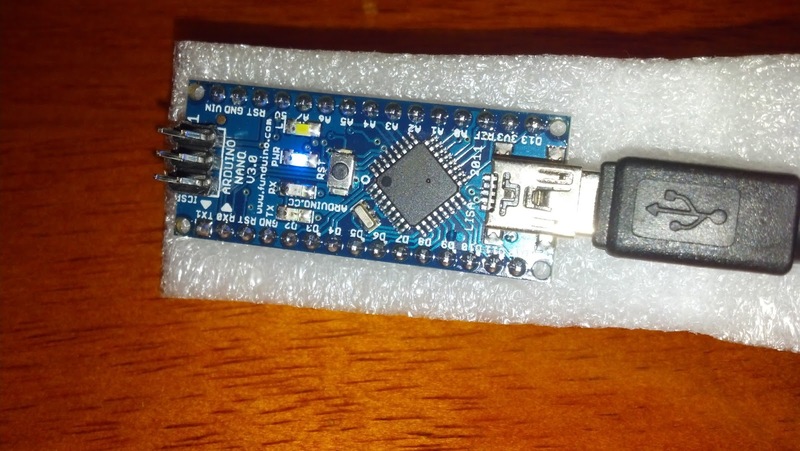 I just purchased an Arduino Nano (http://arduino.cc/en/Main/ArduinoBoardNano). The photo in that link shows the 2.2 version, but I received the 3.0 version (pictured below). I have a number of ideas for what I'd like to do with it, but the first order of business is getting anything to run. My platform is Windows, so I'm basically following the instructions here. The instructions say that the power LED is green, except that on my Arduino Nano the power LED is actually blue. The driver installation on Windows 8 'just worked', I didn't need to install any drivers, Windows found them automatically and installed the Arduino as a USB Serial Port on COM3. The instructions for the example say that the LED labeled 'L' will blink orange, on my Nano, that LED is white and so it just blinks white. That was basically it. After following those instructions (which were pretty simple) I was able to get code running on the Arduino. It took all of 15 minutes. Now I just need to get some of the other hardware so I can actually do something with it. There's no standard way of getting root access to an Android device. I currently want to root a Droid Razr running 4.0.4 and I found some instructions for how to do so here. The rooting process is nice in that it doesn't require running any special code that some Internet rando developed, but the instructions don't actually say what is going on. Since I can be a little paranoid, I'm not about to run whatever commands someone on the internet tells me to. First, I want to figure out what those commands are doing. (Note that while the instructions work for the most part, they originally said to put the su binary in /system/xbin, I found that it actually needed to be placed in /system/bin and I've changed these instructions accordingly). So let's get in to it, going step by step through the commands outlined in the instructions. Hook your phone up to your computer in debugging mode and connect to it with adb. These commands are copying the su and debugfs programs from your sdcard to a local directory on your phone where they can be used later. su, as I'm sure you all know, is a program that allows a user to elevate their privilege level to root under the right conditions. debugfs isn't quite as common. It allows the user to easily examine and modify characteristics of the filesystem. In this case it will allow us to change permissions as a part of the rooting process. It isn't clear to me where the best place to get these programs is, so I'll leave that to you. Here we're making sure any user can read and execute su and debugfs. Pretty standard stuff. This is a little strange. Why are we moving 'batch' and replacing it with a link to some random device? We'll start with looking at what exactly /dev/block/mmcblk1p20 is. We can see that mmcblk1p20 is an alias for 'system'. Now, looking at the 'mount' output, we see that /dev/block/system is mounted to /system. So we're making /data/local/12m/batch point to /system instead of whatever it pointed to before. Why would we do that? We can see that here the shell group has read, write and execute access. Since the contents of /data/local are group “shell” and group-writable, we can modify the contents of this directory using ADB. By logging into the device and replacing one of the sub-directories listed here with a symbolic link, then when the device reboots it will change the ownership of the symlink target to group “shell”. 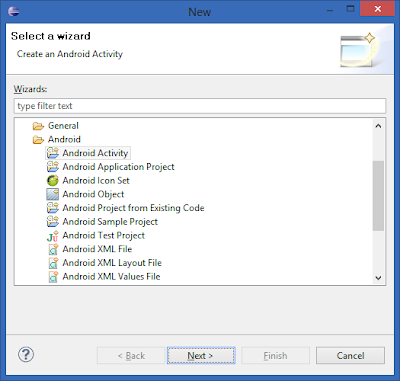 This can be used to edit property files to manipulate the behavior of ADB to achieve root. So, by creating this symbolic link and rebooting the device, we're changing the permissions of /system to allow the shell group to have read and write access, which is exactly what we need to get root. Now that we've made those changes we reboot to get them to take effect. This puts the batch directory back the way we found it; though /system will still have the updated permissions. This opens the mmcblk1p20 device (that contains /system) in readwrite mode within debugfs. This puts the su binary in /system/bin, sets to allow anyone to execute it, has the root user own it puts it in the root group. This removes the temporary files we put in /data/local/12m and then reboots. When the system comes back up, we should have root. The rest of the instructions tell you how to install superuser, make sure you have root and how to keep it. That's all pretty standard stuff, so I won't go in to it here. Have fun. In the last post I explained how to pull an Android APK apart and get it set up in Eclipse and ready for development. 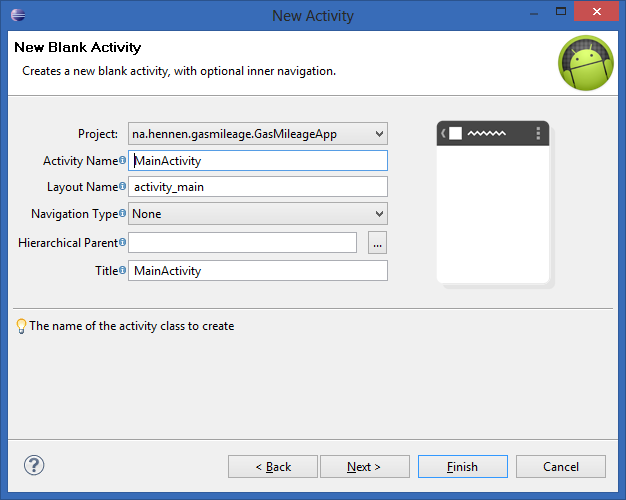 In this post I'll explain how we can modify the app, making both simple modifications as well as actually changing the code to add a new activity. This is a very simple tweak, but a good starting place. 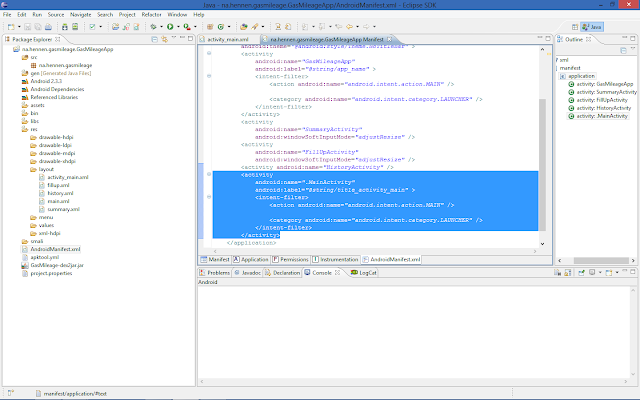 When apktool took the APK apart it extracted all the images as well and stuck them in Eclipse. They're found under res/drawable-*. You can modify or replace them as you see fit, just change the file. Somewhat more interesting is modifying the strings that are displayed or used. This could be useful if, for example, you wanted to direct an application to a different URL than one it was originally programmed to contact. Almost all of the strings in the code should be located in res/values/strings.xml. Double click the strings.xml file to bring it up in the editor. There you can see the values for various strings and change them to whatever you'd like. At this point we can add a new activity to the project and replace the project's main activity with our own. Open the AndroidManifest.xml in text mode and move the new activity up so that it's the first activity. Click 'Play' to start the code in the emulator. This new activity should start instead of the original. Note the 'android:name' of the activity. That's the name of the first activity that gets started by Android. Here it's 'GasMileageApp'. We need to find and reverse it if we want to add our own stuff. We'll use JDGui to do the actual reversing. 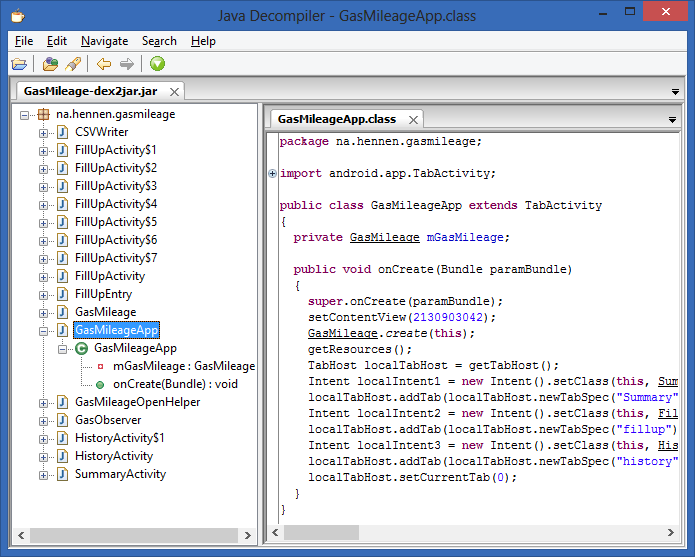 JDGui is the Java Decompiler (there's also an Eclipse plugin, but it's not as easy to set up). Start JDGui and open the jar file that dex2jar created. Find the original activity on the left and open it up. 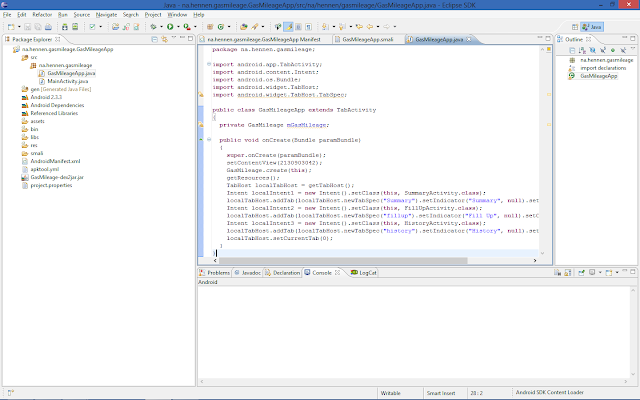 This is the (reversed) code for the original app as it sits in the jar file that's being used to run the program. You'll notice that some things are a little arcane (like the 213090342 number used in setContentView). That's because Android uses a lot of numeric constants for things and JDGui just sees it as a number and can't necessarily resolve it back to the thing it actually refers to. That's OK though, it should still work for us, but it may make it harder to figure out exactly what's going on. Now we need to figure out how to modify this. 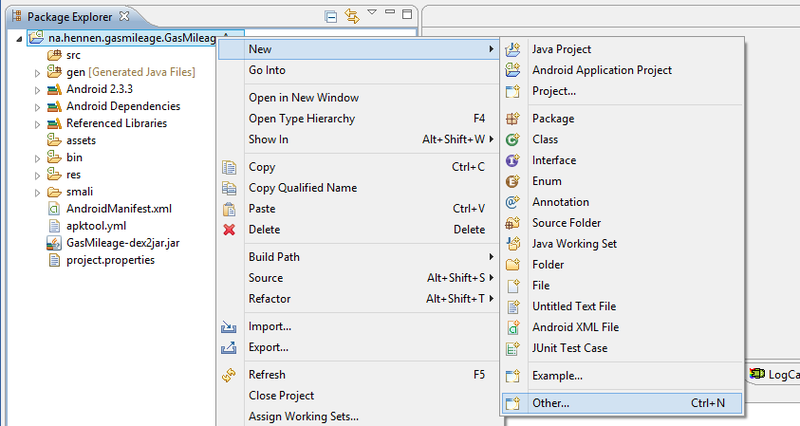 To create our own version we'll actually create a new class with this exact name (and Java namespace) in Eclipse and then we'll cut and paste the code from JDGui in to that file. If we compiled and ran this now, we'd run in to a problem; we'd have two copies of GasMileageApp.class. 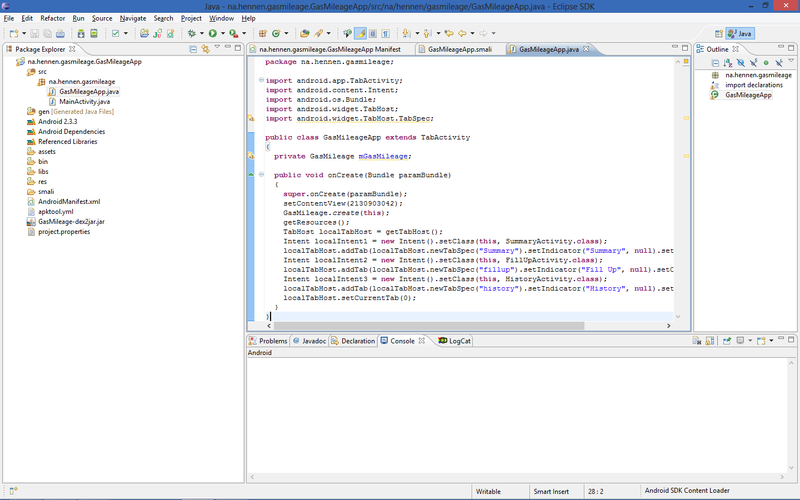 One is from the dex2jar'd jar file we created the other is the one that Eclipse compiled from this source code. So, we need to get rid of the one from the dex2jar file. To do that, open the dex2jar'd jar file in 7zip (or your favorite zip utility) and delete na/hennen/gasmileage/GasMileageApp.class. 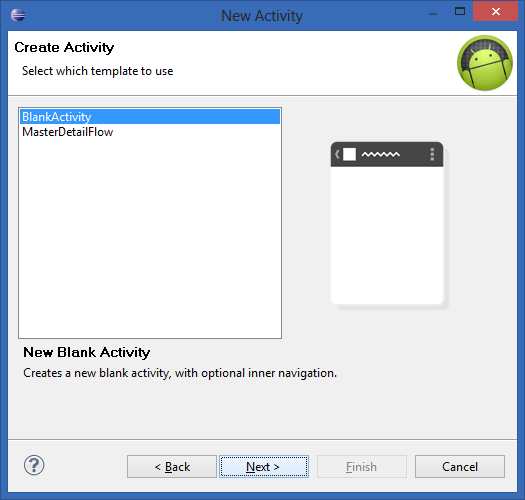 Now that it's been deleted, go back to AndroidManifest.xml in text mode and move the activity you added before (the default name is MainActivity) back to the bottom where it started. This will let GasMileageApp be the first activity that starts, which is exactly what we want. Everything should be in working order now. Run the program again just to make sure. You should see the original GasMileageApp screen and not the new activity. So, we still don't have our own activity in there doing anything. To do that we need to understand how GasMileageApp is doing it. The important part is the onCreate() function. 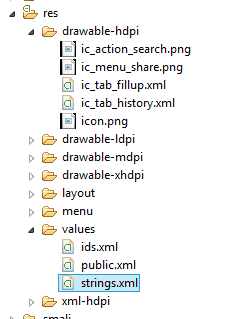 Here we can see that it's adding the 'Summary', 'Fill Up' and 'History' activities by creating new TabSpecs. We can just copy one of these lines and update it to add our own activity. So, add the following after the last call to addTab. That's all we need to do. 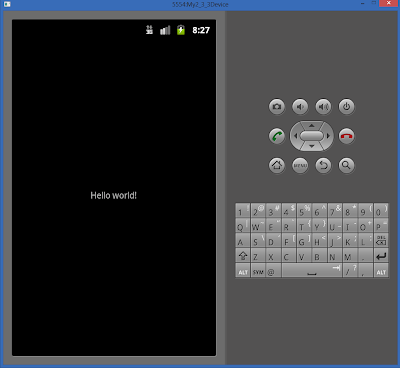 Run the application and click on the new 'Hello World' tab. Now that we have our own activity integrated with the rest of the application we can just write Java code to make any changes we want. 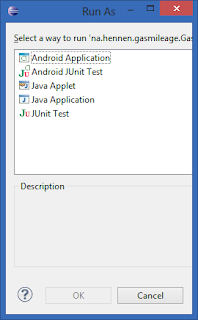 If you need to change an existing class you've seen how to do that using JDGui to get the original code and how you can then put that code in Eclipse and modify it as needed. 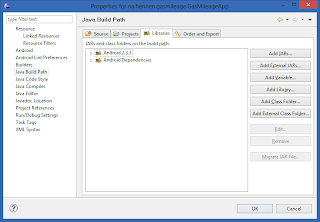 The benefit of this method (as opposed to modifying the Smali files) is that you get to make your changes in Java and in the normal Android development environment. That means you can make more than just minor tweaks. You can add entirely new activities with new user interfaces. 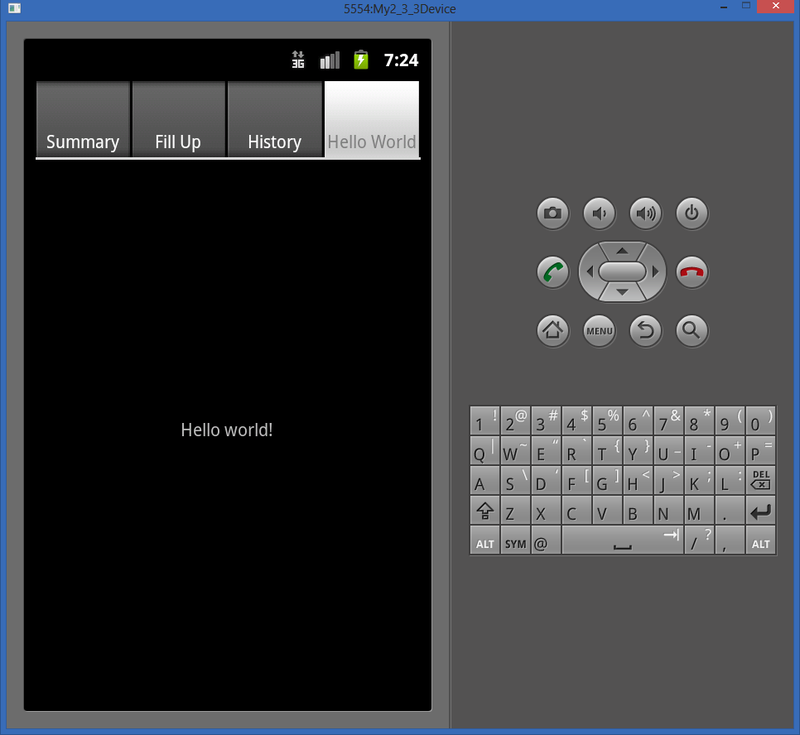 There are a couple tutorials out there that show you how to reverse engineer Android applications. 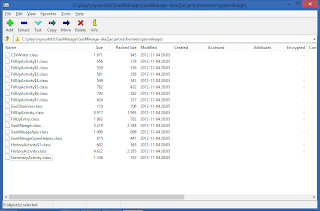 Usually these leave you with smali files which you can modify and recompile or they leave you with a .jar file that you can browse with a Java decompiler. Both of these methods leave something to be desired, namely; a good environment for writing new code. 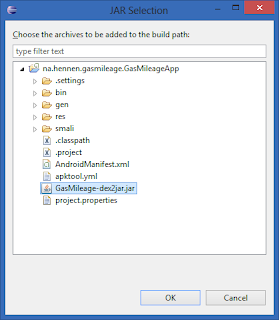 Smali files are a reliable representation of the code, but they're hard to use and they don't integrate with Eclipse and the typical development environment an Android developer is used to. Generating a jar file is more desirable. 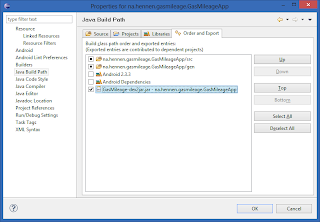 Of course, we need more than just the jar to compile the app; we also need its resources and the android manifest. Most tutorials focus on either apktool to get the smali files and the resources or dex2jar to get a jar file which can then be decompiled. Here I'm going to demonstrate how to use both apktool and dex2jar together with Eclipse to reverse and then extend an Android app. The end result will be a development environment that is easy to use and should allow major changes to be made to the app without any significant hardship. The APK file is how Android apps are stored on your device. Before we can do anything else we need to have the application's APK. There are a couple ways to get this file, but we're not going to get in to them here. For the purposes of this article I'll be using an APK from a simple app of my own, GasMileage.apk. Note that the destination directory shouldn't exist until you run this command. 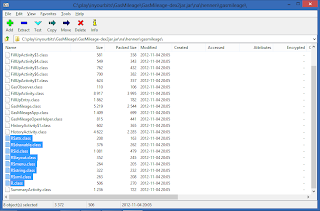 Move the jar file in to the destination directory created by apktool. 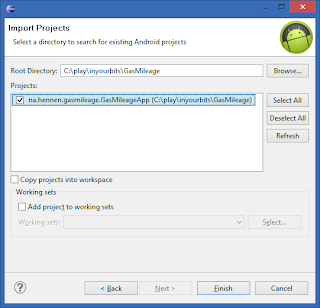 Import the directory in eclipse as an Android project. 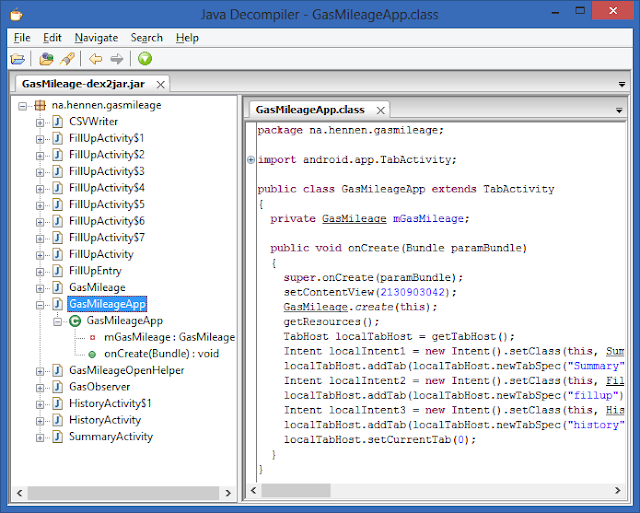 The jar file created with dex2jar contains the resources classes, however Eclipse is going to build those resources fresh when it compiles the project. 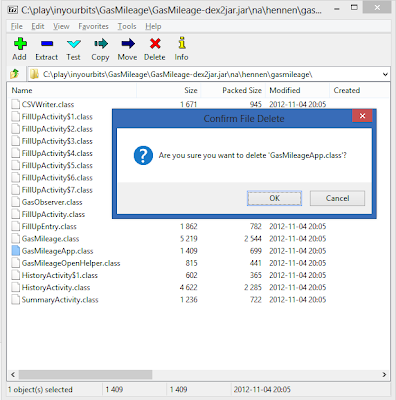 So, we need to remove the resource files from the jar file so that the compilation works. 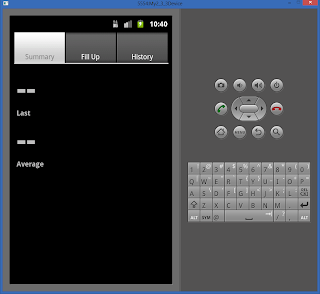 Now we're going to run the app in the Android emulator to make sure everything is working properly. Note: there are some APKs that this method does not work for due to flaws in the dex2jar process. Now that we've taken the application apart and put it back together again we can begin the process of actually modifying the behavior of the program. We'll cover that in the next post.